Aliya’s Beauty Parlour & Hair Design provide a wide variety of Beauty & Hair treatments to restore your vitality and leave you feeling fantastic. At Aliyas, we ensure that each client’s need is assessed and treatments that are provide, not only meet but exceed expectations. All of our staff is fully qualified and trained. 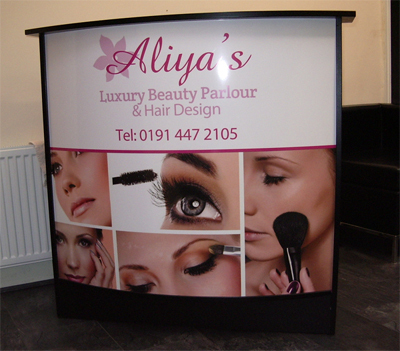 Aliya qualified and trained by Depilex and in the USA and has 22 years of experience as a beautician. From our parlour on Stanhope Street, Newcastle our dedicated team of beauticians offer a friendly, professional approach and use the latest techniques and treatments available to rejuvenate you from head to toe in comfortable, relaxed surroundings. One of our parlour’s is beautifully situated on Croydon Road, Newcastle. Not far from city centre and convenient for surrounding areas. Our South Shields parlour is situated on New Green Street (Laygate). Very convenient for surrounding areas.